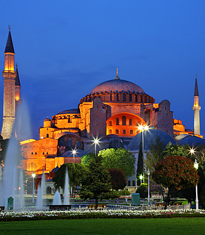 Istanbul is the largest city in the Republic of Turkey. It is located on the shores of the Bosphorus, and is bordered to the north by the Black Sea, to the east by the region of Kocaeli and the Marmara Sea and to the west by Tekirdag and the Kirklareli region. The city covers a total area of 5712 km² including, within the urban district, the islands of the Marmara known as the Princes Islands. It is flanked by a range of high hills to the east of the Bosphorus, the highest of which is Aydos (537m.) near Kartal. Camlica hill (229 m.) east of Uskudar, is a recognized tourist spot. Forests surround the city sporadically, the most extensive being the Belgrad Forest which is 20 square kms, to the north of the city.